The Harbour Lights is situated on the seafront of Stranraer with outstanding views over Lochryan. A few minutes walk takes you to rail links to the North. Our rooms have recently been refurbished to a very high standard with complimentary trays, which consist of tea and coffee, hot chocolate, herbal tea, biscuits, sweets and bottled water. 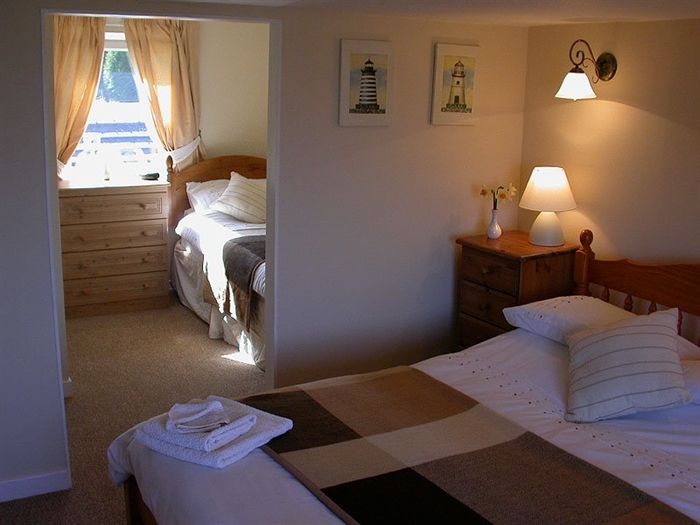 There are colour TVs and DVDs in all rooms and all rooms have en-suite facilities. We also have the facility for wireless internet connection if required. We pride ourselves on our freshly prepared breakfast using local produce which is all cooked to order. Special dietary needs can be catered for. We are central to the areas four main golf courses, and a few minutes drive to the local Driving Range. Castle Kennedy, Glenwhan and Port Logan gardens are also within a short drive. Agnew Park, which is just 200 yards away, can provide entertainment for the family with pedal boats, small train, crazy golf and play park area. Stranraer contains various award winning restaurants which cater for all tastes and preferences. We have sample menus for many of the restaurants for you to view before making your choice and if you wish, we would be delighted to reserve a table at any restaurant you wish. We have freezer facilities for fishing parties and an enclosed area at the back of the house where you can leave your cycles. You will receive a warm welcome at the Harbour Lights. Colin and Rhona will do everything they can to make your stay most comfortable.